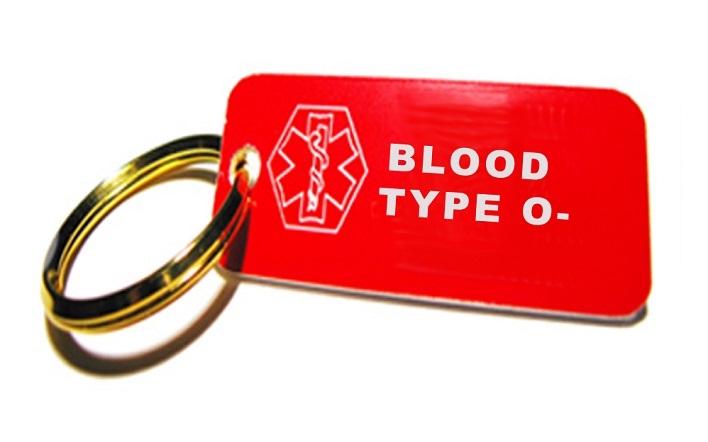 O-negative blood type is relatively rare. A person with O-negative blood is a universal donor but can only receive blood from the same group. Blood group is determined by the presence of antigen(s) on the membrane of red blood cells. The "antigens" are special molecules that can elicit an immune response. Human body recognizes its own antigens and the immune system normally will not attack own antigens (and thus the cells bearing these antigens). However, any foreign antigen will not be recognized as native and an immune response will be generated to eliminate the foreign antigens. One of the components of this attack is antibodies (special class of molecules that bind to antigens and helps immune system eliminate foreign antigens and the cells bearing them). This article will give you a basic understanding of blood group, especially of O-negative blood group. ABO blood group and Rh blood group is determined by the presence of three antigens ("A" and "B" for ABO system, "Rh" for Rh system). These two are the most important blood grouping systems and are based on the three most important antigens, i.e. A, B and Rh. It is important to note that the two are two different blood group systems that are quoted in combination. ABO blood group system is determined by the presence of A and B antigen. Rh antigen determines the Rh blood group system category. There are numerous other less important antigens and therefore numerous other blood grouping systems. A person with "A" blood group will have "A" antigen on the red blood cells and anti-B antibody in the plasma. Similarly, a person with "B" blood group will have "B" antigen on the red blood cells and anti-A antibody in the plasma. A person with "AB" blood group will have both "A" and "B" antigens on the red blood cells and none of the above mentioned antibodies in the plasma (neither anti-A nor anti-B antibody). Blood group "O" means absence of both "A" and "B" antigens and both anti-A and anti-B antibody in the plasma. The positive or negative in the blood group refers to the Rh antigen. A "positive" blood group means that the person has Rh antigen on the red blood cells whereas a "negative" blood group means that the Rh antigen is absent on the red blood cells. Unlike ABO system, an Rh -ve person will not have anti-Rh antibody in the blood unless he/she has been previously exposed to Rh +ve blood. Soon after birth, newborns develop anti-A and/or anti-B antibodies but not the anti-Rh antibody. The table below will show what have been discussed above directly. Knowing you belong to A, B, AB, or O-negative blood group (or positive) is important because it is vital for saving life many times. Blood group matching is important so that the transfused blood is not attacked by the immune system of the recipient. The body will attack any foreign antigen, e.g., a person with blood group B will be having B antigen on the red blood cells and therefore "A" antigen will be foreign. If any blood type with A antigen (A or AB blood group) is transfused, the immune system will attack such cells and this will result in the breakdown of the newly transfused red blood cells. A person with AB+ blood group will have all 3 antigens (A, B, and Rh) on his/her red blood cells. Therefore, he can be transfused with any blood group (referred to a "universal recipient"). A person with O negative blood will have none of the three antigens, and therefore can only receive the same blood group (any other blood group will result in immune attack on the "foreign" antigen). However, this person can donate blood to any blood group person as none of the three antigens is present on the red blood cells. As already mentioned, this blood group means absence of all of the three major antigens ("A", "B" and "Rh") on the red blood cells. It is important to note that there is no "O" antigen on the blood cells. The absence of antigens A and B is referred to as O blood group. This blood group is relatively rare and its prevalence varies among different races. Around 7-8% of the Caucasian population will have it. However, only 1% of the Asian population will have it. Overall, around 5% of the world's population will have this kind of blood. So if you belong to this group, the following aspects will need your special attention. A woman with O-negative blood may have Rh incompatibility issues if she is pregnant with an Rh positive fetus. Complications are likely to occur in second pregnancy with an Rh positive fetus if adequate preventive measures are not taken. However, adequate prophylactic treatment is available and it almost always prevents the complications if taken at proper schedule. The treatment involves injecting the mother with antibodies against the Rh antigen (RhoGHAM) during pregnancy and at the time of delivery of baby. O-negative blood group is the "universal donor" blood group. This means that a person with any blood group can receive O-negative blood. This is very important in emergency situations when a person requires immediate blood transfusion and there is no time to test his/her blood group. Such person can be transfused an O-negative blood. People with O-negative blood can only receive O-negative blood, however. Therefore, occasionally it might be difficult to find O-negative blood for transfusing an O-negative person. It is believed in Japanese culture that a person's blood group determines his/her personality traits. O-negative persons are believed to be more self confident, loyal, competent and passionate. They are believed to have leadership qualities and are considered innovators and trend setters. However, there is little scientific evidence in favor of this believed association and so far blood group has not been found to affect a person's personality.